Fun things to do around RVA. A local group are starting a large apiary (a place where bees are kept and nurtured) and you can be a part of it. Own from a fraction of a hive to a complete hive and receive a check once a year for the profits it produces. These come from leasing the hives to farmers, honey collection and wax collection. Surgery is complete and now we move to recovery. Pins are placed now in the Goose. We now prepare to tie in all the pins for stability and to prevent rotation at the fracture site. 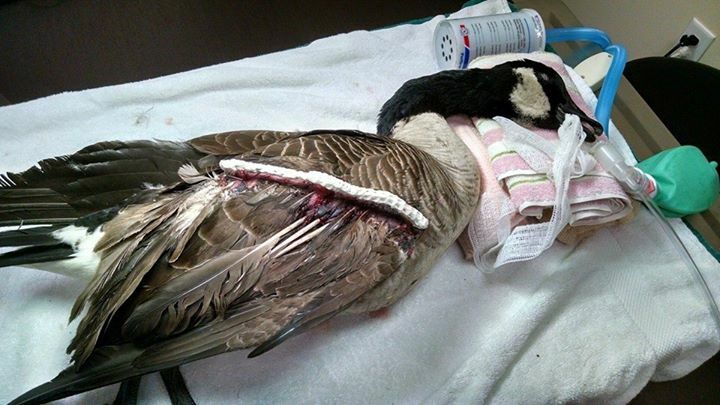 Can you guess what may have caused this Eagle’s injuries? The same type of wound is present on the top of his skull, over his right hock, inside his left leg and throughout the length of his left leg. The answer will be revealed at the end of the day. He is stable and doing well. We started him on antibiotics, an anti-inflammatory, pain meds and rehydrated him. 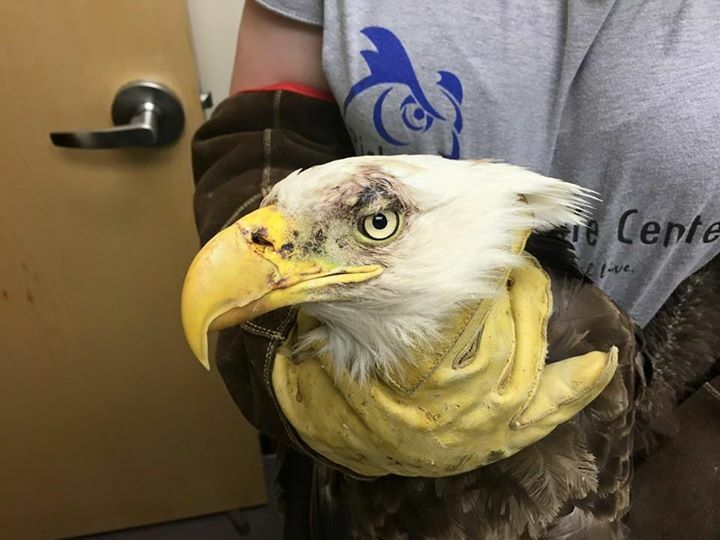 We opted to send him to a different facility than we have sent Eagles previously and will be working closely with their veterinary team should this Eagle qualify for a procedure utilizing Vetrix. We have supplied the team with one sheet of the cellular matrix and may be reaching out to you, our Facebook followers, for financial support should we need additional sheets to get this big guy better. Thank you Dr. Poutous and his rehab team at Sacred Friend – Wildlife Rehabilitation in Norfolk for working with us and giving this guy a shot. 24 hours after surgery, Mallard 15-0047 is doing well. Hit by a car and then attacked by a colony of feral cats, he underwent surgery to pin a wing fracture. The external fixator is visible in the left wing. We will begin light physical therapy with him tomorrow and in 4- 6 weeks the pins will be removed. Barring any unforeseen complications, we expect him to make a full recovery. We could not assist the general public who find these animals in need of help or our patients without your financial support. 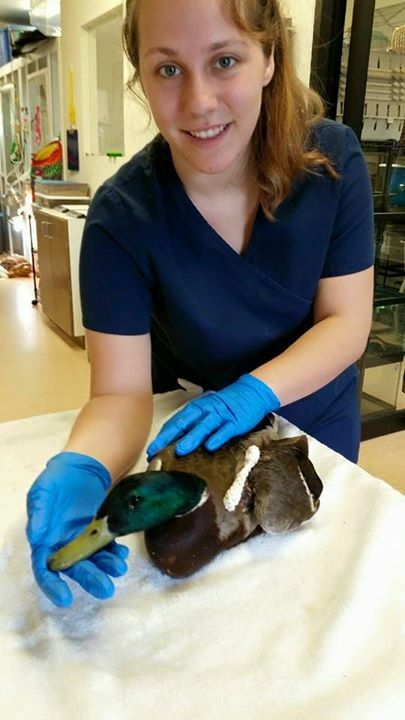 Please consider sponsoring this duck’s care. Donations can be made here. Thank you for supporting the Richmond Wildlife Center . A Wild Fiesta – Our 2nd Anniversary Celebration! 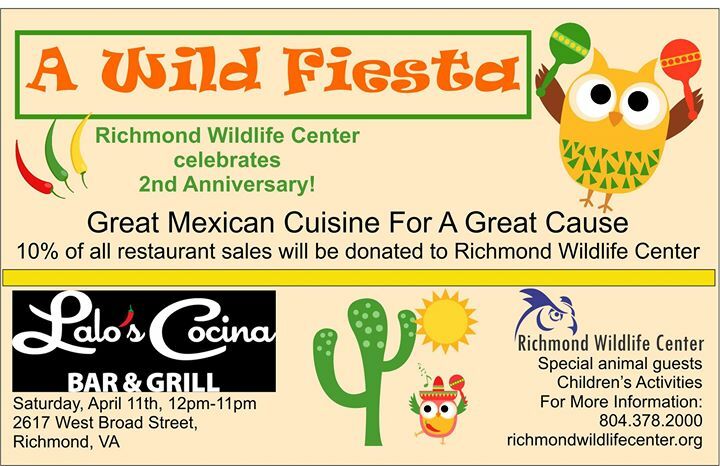 The Richmond Wildlife Center will be celebrating our 2nd Anniversary on April 1st. Join us on Saturday, April 11th at Lalo’s Cocina Bar & Grill to help us celebrate. From lunch time at 12pm until 11pm that evening Richmond Wildlife Center volunteers will be present to help celebrate our 2nd Anniversary. Many animals will be making appearances throughout the day, so be sure to stop in and meet some of our education animals as well as animals available for adoption. Lalo’s Cocina Bar & Grill will be donating 10% off all their restaurant sales this day to our wildlife center, so be sure to bring all of your friends and family to enjoy some great Mexican food! Make a family day out of it! Lalo’s is located across the street from the Science Museum of Virginia and the Children’s Museum. Come see us after your family day at the museum. Parking is available behind Lalo’s as well as on street. Lalo’s Cocina is locate at 2617 West Broad Street, Richmond, VA.
We hope to see you there to help us celebrate this wonderful milestone for our center! 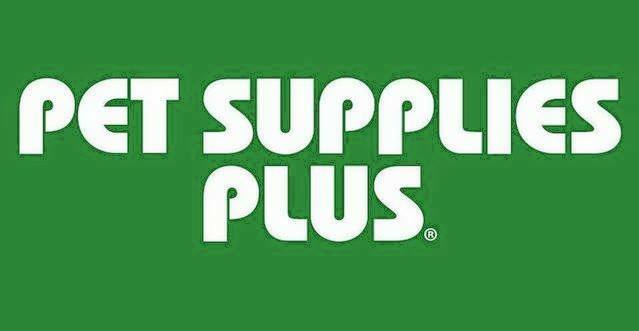 Join us tomorrow, March 21, 2015 from 10am – 4pm as we wrap up Wildlife Week at Pet Supplies Plus. Richmond Wildlife Center volunteers will be present to help point you in the direction of items we need to help care for our patients. Please consider stopping by to purchase an item for a wild patient in need. Thank you for your support! FOLLOW ALL UPDATES ON “PROMISE” THE SWAN BY VISITING THIS POST. ** All new updates will be in Blue. Old Updates will be in Black. Follow this post routinely for updates. Thank you! 1/9/2015 – Please be patient with us. Virginia Department of Game and Inland Fisheries (DGIF) has granted us additional time. We now have until January 21st to identify a permanent placement for Promise the Swan. We are confident we can locate such a home. The Richmond Wildlife Center is hosting a continuing education raptor workshop tomorrow for licensed veterinarians in which DGIF is also participating. We also have 30 patients to care for, provide husbandry and medical care to each morning and evening. Patient treatments start between 8-9am and evening treatments begin at 4pm. Today, 1/9/2015, we only have two volunteers in our center; a licensed veterinarian and a veterinary assistant/wildlife care assistant. We ask for your patience today as we have many patients to care for and we must also prepare to execute our raptor workshop tomorrow which is critical to training more veterinarians in saving the the lives of our Hawks, Owls, Eagles, Falcons, Osprey, Vultures and other Birds of Prey. We hope to send out our permanent placement survey today to all those who have expressed interest in providing a captive home for Promise. However, it may not be until Sunday before we can execute this. We are doing the best we can given we have no paid staff and limited volunteer staffing. Again please be patient with us. We WILL find a home for Promise. In the interim, here is how you can help. Please continue to share Promise’s story. Of the 150 parties who have expressed interest in adopting Promise, the majority of those individuals reside out of state. One stipulation imposed by DGIF is that Promise the Mute Swan cannot leave Virginia. We need more Virginia contacts who may be willing to give Promise a home. Some stipulations that will be mandated may be a financial burden for many. Again, we need more contacts. Please contact your local Virginia newspapers, news stations, bloggers, friends, co-workers and family members. 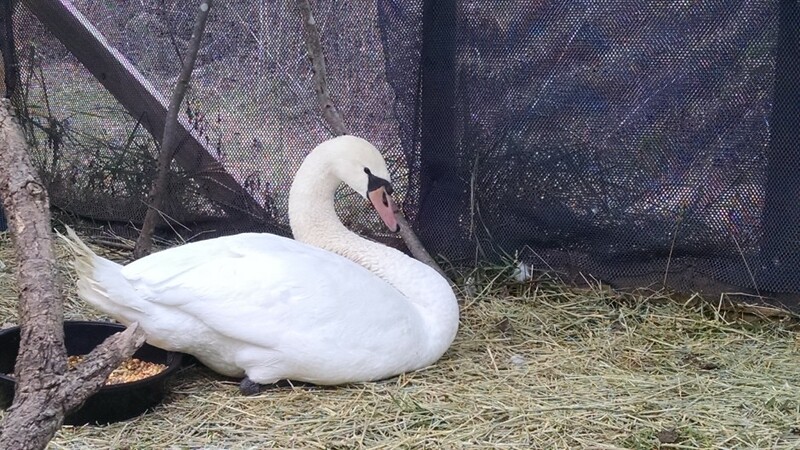 Ask them to share Promise’s story to help us find more Virginia property/landowners owners who may be interested in providing a captive home for Promise the Mute Swan. The property owner/landowner must contact us directly via email to provide us with their information. Please do not provide referrals. Help us raise the funding we need to provide the medical, surgical, tracking, reproductive, blood testing and monitoring requirements in order to ensure we can place Promise and meet all required stipulations. Promise’s needs were NOT in our small nonprofit’s budget for this year. Individuals who would like to support our center’s efforts can make a donation here. Please be patient with us. We will all work together to make this happen for Promise! All contact should be done through email. Please do not utilize social media (Facebook) or phone to reach us. We can be contacted through our contact form. All interested parties should send the following information to us to be added to our list of possible homes. Please utilize our contact form to send the below information. We would like to send put our permanent placement survey to interested parties today, however realistically it may not be until Sunday before this occurs. PLEASE BE PATIENT! WE WILL ALL WORK TOGETHER TO SAVE PROMISE. Now please share Promise’s story below to help us get more Virginia contacts who may be able to provide a permanent captive home and help us to raise the funding we need to save Promise. Thank you for helping us Save Promise! You can share Promise’s story directly from NBC12/Kelly Avellino – Thank you NBC12 and Kelly Avellino for helping us save Promise the Mute Swan! 1/8/2015 5:11pm – We have just received general stipulations from DGIF in regards to the conditions of the permanent placement of Promise the Mute Swan. If you have not already done so please submit your name, phone number and email address if you are an interested party here. DO NOT LEAVE THIS INFO ON FACEBOOK, IT WILL NOT BE RECEIVED. DO NOT CALL OUR CENTER. PLEASE EMAIL US. We will be emailing an initial questionnaire to prospective permanent placement individuals to help us quickly identify those individuals who meet the general stipulations provided by DGIF. We will then work from that list of individuals to determine which individuals meeting the general guidelines will also meet additional specific stipulations. All contact information from interested parties needs to be received by 9AM EST, 1/11/2014. We have until January 21, 2015 to find Promise a home or Promise will be euthanized. We are not permitted to assist, possess or provide veterinary care to any Mute Swan in the future. Those swans found sick, injured, or feral in our state must be destroyed. DGIF has issued us a special possession permit for us to be in possession of the Swan until January 21st. 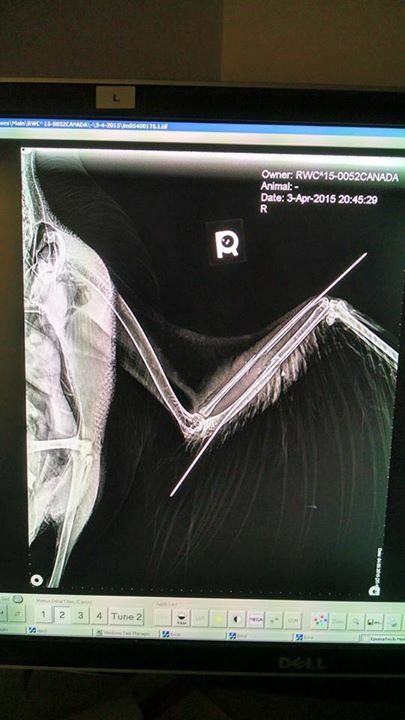 This swan cannot be transferred to anyone else for veterinary or rehabilitative care. To meet all of the surgical, reproductive, tracking, and monitoring stipulations required of the permanent placement we need your financial assistance to ensure we can meet these requirements. This was not in our small nonprofit’s budget for this year. The permitting fee (adoption fee) will be paid to DGIF. So please donate so we can ensure we can provide the services needed to properly place Promise. Donation information and a paypal button for donations is available here. Thank you all for helping us save Promise the Mute Swan. AS A REMINDER PLEASE DO NOT LEAVE CONTACT INFO ON FACEBOOK. DO NOT CALL OUR CENTER WITH CONTACT INFORMATION. PLEASE PROVIDE CONTACT INFORMATION HERE. 1/7/2015 4:45pm – We have not yet received the stipulations from DGIF in regards to the permanent placement of Promise the Swan. We do not know if the 10 days began yesterday or if our 10 day window begins when DGIF provides us with the stipulations. We are worried we may have lost 2 days of our 10 day window. We are collecting names, phone numbers, and email addresses of individuals interested in adopting the swan. Once we receive the stipulations from DGIF we will email all those interested to identify a suitable captive and permanent home for the swan. If you are interested please provide your contact information here. **Please note our telephone only has one line. If we are on the line, no voice-mail will pick-up, and it will just ring. (We are a poor nonprofit and our priority is our patients medical and nutritional needs and not voice-mail for our call waiting at this time.) Please limit phone calls as this prohibits callers needing emergency veterinary care for injured wildlife and non-native feral exotics.We appreciate your understanding. Thank you all for working so hard to help us find a home for Promise the Swan. 1/7/2015 8am- We are working diligently to save “Promise” the Swan. We would like to pause to thank NBC12 and Kelly Avellino as well as Secretary of Natural Resources, Molly Ward, and her staff in the Governor’s office. Secretary Ward’s office negotiated for us at our request with Department of Game and Inland Fisheries. Through those efforts we received a 10 day stay of euthanasia. We have 10 days to find a suitable and responsible captive home for the swan. We do not know all the stipulations to the agreement yet and will learn those today. What we do know is that we may be prohibited from exporting the Swan out of state and it cannot be free roaming where it could potentially escape into the wild again. We will keep you posted as we learn the details and frantically search for a suitable captive home. ESCONDIDO, CA (Oct. 9, 2014) – Today, San Diego-based Stone Brewing Co.announced it has signed a formal letter of intent with the City of Richmond, Virginia, signifying the company’s interest in building its East Coast facility in the city’s Greater Fulton Community. Subject to local approvals, Stone plans to invest $74 million to construct a production brewery, packaging hall, destination restaurant, retail store and its administrative offices. Construction of the facilities will occur in phases. The brewery is anticipated to be operational in late 2015 or early 2016, with Stone Brewing World Bistro & Gardens opening a year or two after that. Ultimately, the company will employ more than 288 people. News Anchor, Amy Lacey of WRIC TV – Channel 8, stopped in to help raise awareness of our wildlife veterinary facility. We would like to thank Amy and Channel 8 for their support of our wildlife patients and center. The complete story can be found here. Update- I wrote this a week ago and never published it. There is more I wanted to add. I am publishing it now because a few friends wanted to see it. Norfolk is now out of contention. I don’t know what perks Ohio and Virginia are offering. Below is just raw data without perks. I have been watching the press releases roll out of Google News Feed ever since Stone Brewing announced expansion to the East Coast. Then I watch people on news and beer forums start talking about each other’s cities, creating facebook like pages etc etc. So I sat down last night, had a nice Stone beer, lit a cigar and started making the below spreadsheet. Probably 1/1000 the size the one Stone is making, but I skim the surface and don’t get paid for this. One of Stone’s biggest expenses is going to be shipping all those kegs and bottles. Trains– The easiest and cheapest way is by rail, if you have a rail yard. The location in Richmond could have a rail running through the brewery. CSX cuts across the back of the property. But lets look at whats already there: Columbus and Richmond have major rail yards. Columbus has the only Intermodal Terminal (transfer from truck to train and visa versa). Maybe trains aren’t an option. Trucks– Richmond has I81 and I64 cutting through it and is located within a days drive to the entire east of the Mississippi population. Norfolk and Columbus start getting into two day transit times to various cities. This adds a major expense to the shipping. Norfolk’s trucks will be stymied by the Bridge/Tunnels and horrible traffic across the Chesapeake Bay. Deep Sea Ports are another factor to look into. Some shipments may be too large for a truck, and may be best floated south to Florida. Trucking companies charge a lot of money to go into Florida, because they often come back up empty. But trains solve this problem too. Ohio is one of the states with ABV restrictions. No beer can be brewed over 12%. Virginia has no legislation like that. Stone likes high ABV beers. On the flip side, the State Excise tax is $.18 in Ohio vs $.26 in Virginia. Stone’s RFP said they initially will produce 120,000 barrels and then ramp up to 500,000. The difference between the Excise Taxes are around $300,000 to start and $1,240,000 a year when fully scaled. Ohio loses on the types of beers brewed, but wins on the Excise Tax. However, Richmond’s business taxes on equipment and property are far less. I think this is a carry over from the tobacco days, but RVA does well with low business taxes. When spending $10s of millions in a production facility, this is a huge savings. All of us that live here, love Richmond. While our cost of living is below the national average, we aren’t as cheap as Columbus. We are cheaper than Norfolk. However, Columbus loses in property taxes, having some of the highest in the country. Utilities were hard to peg. Columbus electricity is run by the government, so seemed kind of a flat rate. Here in Virginia, Dominion Power has sliding scales for different times of the day and amount used. Stone will do best to run it’s high electricity machines like bottling lines at night to save money in Virginia. Of course, it will probably incorporate solar to offset this. Water was all over the map. Richmond has good prices on water, but high on waste water. Stone will have to pay the waste water fee on water not put into it’s beers. Trust me, breweries use a lot of water to clean and sanitize. There may be a commercial rate I am sure the city could dig up for them. While talking quality of water, Richmond wins. Our water is some of the best in the country (probably related to the high waste fees) and the James River flows much cleaner through the state. If you compare natural minerals in the water, our water fits brewers perfectly as not much tweaking needs to be done to match recipes. In fact, our water is very similar to the ancient city of Plzen (Pilsen). I think it is agreed that Richmond wins on tourism. Norfolk may draw a few tourists to make the 40 minute drive away from Virginia Beach, but it is not an easy destination spot. I honestly don’t remember much about Columbus. I drove there once to see Ray Charles during my college years. We went to Papa Joes afterwards and drank beer from a plastic sand bucket. But unless your child goes to Ohio State, or you are from there, I never hear of anyone marking Columbus as their summer vacation. It is a lovely city from what I remember. I think one thing I really want to see in RVA, is Stone Brewing versus Mekong Restaurant in the annual Dragon Boat Race. I think that would be epic. Who knows, maybe some of the plans are to put a dock behind the brewery and you can boat to the restaurant/garden. Why no one has done this in Richmond, I don’t know. 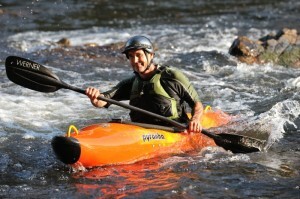 Outdoor Magazine loves RVA, hopefully Stone sees our natural beauty as well. As Richmond, Norfolk, Columbus, Ohio and Virginia scramble to make adjustments to laws, zoning, taxes and what not, Stone sits patiently enjoying it’s new brewery in Europe. All three cities are great in their own way. I am sure we will not be privy to the tax credits being offered until the deal is inked. While the taxes are slightly higher in Richmond, the utilities are less and business equipment taxes are lower. Richmond wins on shipping and closeness to the major cities. This is important as you ship seasonal products and need quick delivery. It is a close race on my small spreadsheet. It will be interesting if Stone discloses what pushed them to their final choice. Distance to Major Cities in hours by truck, with no traffic…. Here at FunRVA we love beer. The city has grown so much in the last few years with quality breweries. There are just so many tasty options! We want to here from you! This is for the true beer geeks! If you have tried all of these, give us your vote! If you haven’t tried them all, you have some homework to do! This poll will last Until Sept 9th, so get out there! Center of the Universe "Pocahoptas"
Licking Hol Creek "‘Til Sunset Session IPA"
Rusty Beaver "Buck Tooth “Big Bite” IPA"
Strangeways "PHANTASMIC EAST COAST IPA"
Virginia is brewing some really tasty craft beer and the nation is noticing. The craft beer industry in Virginia has boomed very quickly from just a handful of breweries a couple of years ago to more than 80 as of this writing. It appears that Virginians and visitors passing through our beautiful Commonwealth are enjoying the liquid love on tap. If 80+ breweries seems overwhelming, let this be a quick-start guide. Go where the big awards are (World Beer Cup and Great American Beer Festival, for starters) and then launch your flight tastings from there. Here are 11 award-winning craft breweries you should try now in Virginia. 1. 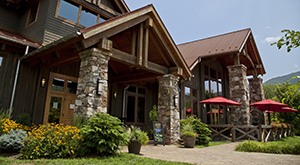 Devils Backbone Craft Brewery in Roseland is a solid craft beer starter experience. DBB has certainly made a mark for itself in the world of craft beer since its 2008 opening. In 2013 alone DBB brought home six Great American Beer Festival (GABF) medals, plus two World Beer Cup (WBC) medals this year! Such acclaim boosts you to statuses like Small Brewing Company and Small Brewing Company Brewer of the Year (2012 and 2013 Great American Beer Festival) and Champion Brewery and Brewmaster (2010 World Beer Cup). 3. Apocalypse Ale Works in Forest proclaims, “the end of bad beer is here!” and they invite you to try what championship judges have loved. 5. Hardywood Park Craft Brewery in Richmond operates a sustainable operation, with their energy being charged by wind and other renewable sources. If that doesn’t make you feel good about a visit, maybe a World Beer Cup acknowledgement will. Hardywood Gingerbread Stout won a 2012 WBC Bronze Medal in the Herb and Spice category. 7. 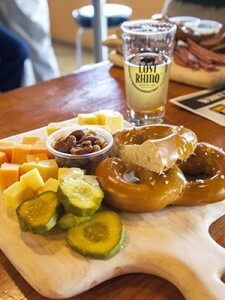 Lost Rhino Brewing Co. in Ashburn pairs locally-sourced eats with their gently handcrafted brews. Try the Rhino’fest Märzen, just released for the season today! It was awarded a gold medal in the German-Style Märzen category at the 2013 Great American Beer Festival. 8. Smartmouth Brewing Co. in Norfolk claims to “geek out to the science of brewing,” which is becoming evident when the judges of the Great American Beer Festival award them a bronze medal in 2013 for their Notch 9 Double IPA. Great effort sometimes equals great reward. 9. Three Brothers Brewing in Harrisonburg is actually comprised of three brothers a’brewin’. The brothers and their brewery are homegrown and loyal to their local roots, which makes a bronze medal for their Rum Barrel Belgium Dubbel Style IPA all the sweeter (2013 Great American Beer Festival). 10. Wolf Hills Brewing Co. in Abingdon only distributes locally to ensure optimum freshness and flavor. That being said, more than the region is taking notice of their brews. 11. South Street Brewery in Charlottesville was founded in 1998, but you’ll have to wait a few weeks for the grand re-opening of this local brewpub. Here’s to hoping their award-winning beverages are still on tap! Without a doubt there are tons more medals hanging around bottles in Virginia’s brewpubs. Explore and taste for yourself, especially during August Virginia Craft Beer Month, and let us know via the comments section about your favorite award-winning Virginia craft beer. 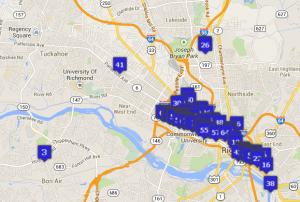 We are happy to show an interactive map showing Richmond’s Weekly Food Specials and Happy Hours. We are always looking for more, and readers can submit their favorite places by clicking here. We love the diverse selection of restaurants offering delicious food and beverages. It you are visiting RVA, we hope this map helps you find something you like near where you are staying. Or give you an idea of what part of RVA to go visit. We are always on the lookout for more. The VA ABC forbids restaurants to list what their happy hours consist of, but we can list RVA Happy Hours here. You as a consumer are able to list them with us. We will be working on new features as time goes on, so please leave your feedback and ideas below. “What do I like about Virginia? The countryside. It’s magnificent,” said Robert “Oz” Clarke. Clarke recently sat down to discuss his 2013 trip to Virginia, at which time he was the keynote speaker at the Virginia Wine Summit. Before Clarke discussed Virginia’s ability to grow great Viognier, Petit Verdot and Cabernet Franc, however, he gushed over Virginia’s Southern hospitality, history, and music. Check out the video. 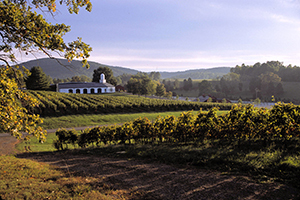 Learn more about visiting Virginia’s wineries at Virginia.org/wine. Virginia has had a long love affair with beer; it’s been enjoyed here since 1607 and we even have a recipe from George Washington for his brew. From Ales to Vienna Lagers and everything in between, dozens of breweries across the state help quench our thirst for quality quaffs. If that wasn’t enough reason to celebrate, here is another: August is officially Virginia Craft Beer Month, and many breweries, restaurants and bars have special events and other offerings to raise a glass to. It’s no secret that it’s a great time now – as well as the whole year through – to enjoy a Virginia craft beer, but there are a few insider tips for making the most of the sips, and we spoke with five brewmasters to learn a few. 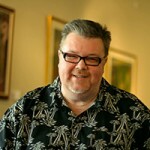 Farris Loutfi of Lickinghole Creek Craft Brewery. Sarah Hauser, Virginia Tourism Corporation. Signature Brew: Three Chopt Tripel is a non-stopped-hopped version of a European Classic. What I like about it is the fantastic combination of citrus, spice and honey notes the beer has. It is also remarkably refreshing and drinkable despite it’s high ABV of 9.3 percent. 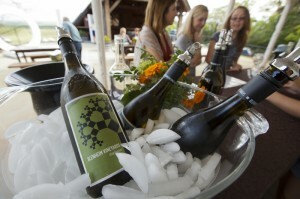 Tours/Tastings Offered: Open Wednesday through Friday, 4 p.m. to sunset and Saturday and Sunday, noon to sunset. What has caused the explosion of interest in craft beer in Virginia? The quality of Virginia craft beer is second to none, [and the] breweries themselves are fantastic destinations to visit and bring out of town guests. Craft beer gives a sense of regional identity to a place and gives those who live in the area something they can take personal pride in. What sets Virginia breweries apart from others? Virginia craft breweries focus on quality in every aspect of their business. We create unique beers and serve them in a fantastic setting. How can someone make the most of a brewery tasting room visit? The best way is to try and have a clean palate between tastings and to take notes [that includes the] brewery name, beer name, beer type, general descriptors and some type of rating system. What are some beer and wine pairings you like? Batchleors Delight Rum Barrel Aged Belgian-style Quadrupel Ale paired with roasted lamb and Three Chopt Tripel with fresh scallops. How will you be celebrating Virginia Craft Beer Month? Two beer releases: Creator German-Style Doppelbock on Aug. 9 and Rosemary Saison, made from rosemary on the farm, on Aug. 16. Lost Rhino Brewing Company. Sarah Hauser, Virginia Tourism Corporation. Overall there is a growing appreciation of small business and local craft. In our increasing homogenized world many are looking for a unique experience, be it food, drink or art. Without a doubt the variety of styles. Virginia breweries are producing a wide array of different styles from crisp lager to wild ales and doing them well. If you have the time and inclination start up a conversation with a regular, they will steer you to the must try of week. Face Plant IPA – I think our India Pale Ale goes great with any grilled foods, especially seafood. Woody Stout- This bourbon barrel-aged stout as you can imagine goes very well a chocolate desert, but it very fun to pair strong cheeses with this roasty sweet beauty. Lost Rhino will be releasing Native Son, our all-Virginia Beer. Every ingredient in this beer is from the commonwealth. Signature Brew: Black Rye IPA – it combines the roastiness and body of a dry stout with the hop-forward aroma and finish of an IPA. Tours/Tastings Offered: The taproom is open Fridays, 4-11 p.m., Saturdays, noon-11 p.m., and Sundays, 1-11 p.m.
[It] is due primarily to the passage of [a bill allowing] breweries to sell their product in an on-site tasting/taproom. Small breweries such as Redbeard [can] focus on clientele and [create] a solid portfolio of quality offerings without the need to distribute all of our product to wholesalers at low margins. What are some craft beer trends you see? The revival and Americanization of Old World styles like sour beers, and the expansion of the lower ABV (Alcohol By Volume) “session” segment of the market. Sour beers of various type are extremely en vogue, [ranging] from a light tartness [to] the sourest thing on earth. 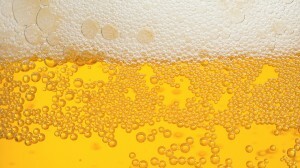 The lower ABV beers that are in fashion are a great way to enjoy the act of drinking, without getting drunk. Know what you’re getting into, do your homework, make sure they’re open the day you will visit, make sure the beer styles they typically offer are up your alley. Drink what you think you’ll like, eat what you think you’ll like. Be adventurous once you’ve had your fill of those to expand and educate your palate. There’s a new beer to try and new friends to make any time you visit, any time of the year. Signature Brew: Track 1 Amber Lager was created to produce the flavor profile identified by the focus group research conducted for us by Martin Research. Track 1 is robust in a subtle manor with the emphases on malt. It is a true,” Session” beer with low after taste and a silky smooth mouth feel. Tours/Tastings Offered: Wednesday through Friday, 5-9:30 p.m., Saturday, 2-7:30 p.m., Sunday, 3-6 p.m. Recent [laws] allowing breweries [that permit] on premise sales. 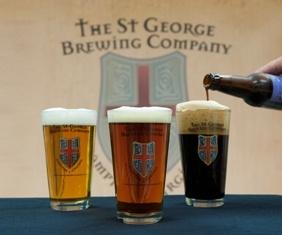 Signature Brew: St. George IPA, a classic, English-style India Pale Ale full-flavored beer, easy drinking without overwhelming the taste palate. Tours/Tastings Offered: Retail sales are Monday-Friday, 10 a.m. to 5 p.m. and tours are Saturday, 10 a.m. to 5 p.m.
Virginia has seen quite a few microbreweries since they came on the scene in the late 1970′s. The Chesapeake Brewing Co in Norfolk was the first in Virginia and Legends Brewing Co in Richmond being the oldest existing microbrewery. The recent spurt follows a trend that has been taking the whole country by storm and has been helped in no small part by the passage of a new Virginia law which allows brewery tasting rooms to sell for on-site consumption of their beer. The bigger difference, I believe, is really brewery to brewery, regardless of what part of the country they are located. [In general] start with beers that won’t ruin your taste buds too quickly and then work your way, brewery to brewery, up to the more extreme types. [At a festival] pick a specific style and them sample each breweries offerings of that style for comparison. Get in the longest line you find because they will be the most trending and most likely run out soonest. St George Porter with it’s rich chocolate and coffee notes goes with any type of chocolate. Personally I’m celebrating by having a different Virginia beer every day. 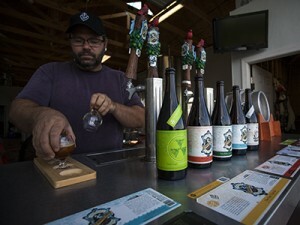 The brewery has several events on tap. Don’t start pulling out the sweaters yet! We have quite a while until we’ll need those, but before the cool air starts coming in, these vacation hot spots are great for your late summer escape. Breakfast of choice and picnic lunches. It’s peach time! We’re in primetime peach-picking season, which means festivals, pick-your-own days at orchards and plenty of peach goodies to go around. Spend a day (or two) in Crozet at Chiles Peach Orchard’s Peach Ice Cream Days. Fresh, homemade peach ice cream is available at the orchard these dates only! Made by the Crozet Lions Club, this event is a fundraiser for their community service activities. Enjoy this special treat after picking your own peaches (or choosing from their fresh-picked selections). Peaches, nectarines, and local produce are also available. Come to Marker Miller Orchards with an empty stomach and enjoy a day of sweets: peach cobbler, peach pie, peach turnovers, peach ice cream and of course, fresh peaches galore! Enjoy music from 1-3 p.m. while sitting on the front porch or in the picnic pavilion. A variety of food will be available at the food building. 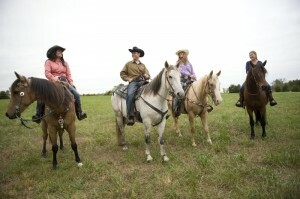 Don’t forget to let the kids enjoy the cow train and the peaceful scenery during the wagon ride around the farm. Spend a weekend of peaches and pooches at the Dog Days Peach Festival at Great Country Farms in Bluemont. It may be the hottest part of the summer, but the Dog Days at Great Country are all about fun with the family and canine companions! Bring the whole family for a romp in the play area and to u-pick peaches in the orchard at the peak of perfection. Enjoy the Doggie Olympic Games and demonstrations that will keep tails a-waggin’! Peaches, peaches everywhere! Bring the family out to Richard’s Fruit Market Peach Festival in Middletown for a day of peachy fun. Haywagon rides, barrel train rides and all the jumps you can handle on the bouncy-bounce, plus music and a petting zoo, and peaches, of course! Peach ice cream, milk shakes, sparkling cider, smoothies, pies, muffins and more! Fresh from the farm food for sale includes our own burgers and plenty of tasty treats! 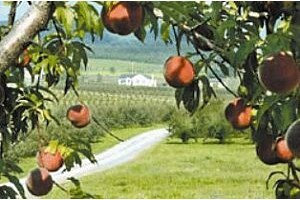 The largest concentration of peach orchards in Northern Virginia, The Peach Way features five orchards within five miles: Virginia Perfection/Valley View Farm, Hollin Farms, Hartland Orchards, and Stribling Orchard. The Peach Way is near several wineries, Sky Meadows State Park and more—perfect for a day or weekend trip. In response to market demands, Saunders Brothers started growing super tree-ripened peaches; including sub-acid white-fleshed peaches, many of which get great size, color, and flavor. 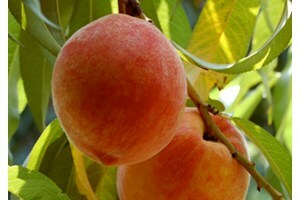 These peaches complement the yellow-fleshed varieties and extend the season from June 15 until late September. The Farm Market offers a fun place for the whole family to enjoy. Not only can you find a variety of peaches, apples and vegetables from May through November, they also offer ciders, jams, relishes, and salsas. Be sure to try out the amazing peach ice cream and check out the on-site museum; one of the largest privately-owned collections of farm antiques in the state of Virginia. Ayers Orchard is located at the foot of the beautiful Blue Ridge Mountains and offers pick-your-own peaches, as well as cherries, apples, nectarines and plums. The orchard also offers fresh-picked and picked-to-order. Hiking and picnicking are encouraged; all ages are welcome at the orchard.